We are delighted to welcome up-and-coming Italian producer, Giovanni Damico to the Landed camp – an artist who is fast making some strong waves in the Deep House scene. Emotional and poignant, ‘Darwin’s Theory EP‘ is a perfect mixture of true underground House music. Giovanni’s understanding of the raw and deep far exceeds expectations. A1: Breezing – Original Mix: Giovanni kicks off the EP with an infectious, warm-up number. A beautiful floating riff transports you immediately onto the summer vibe, while loose percussions, smooth pad chords and a deep grooving FM bass continue the magical trip. As the vocal says, “We are a proud minority”. A2: Touchè – Original Mix: Giovanni follows on seamlessly with a fresh dose of straight-up House music – a sound he does so well! The vibe is set by a strong, upbeat, afro percussion mixed with Mr G’s unique trademark synth riff. With soulful vocals completing the picture, this one is off the hook! A fantastic modern take of the 90s vibe. 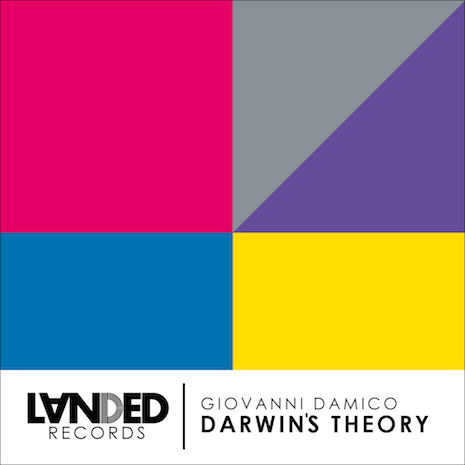 B1: Darwin’s Theory – Original Mix: When you hear tracks like this, you know summer is finally here! Fat with funk, soul and deep emotion, and flavoured with divine female vocals and delicious musical elements throughout, Darwin’s Theory is the essential, true summer anthem. We are over-the-moon to be releasing such a timeless classic! B2: City Ghost – Original Mix: Rounding off the EP with a deep and dubby vibe, City Ghost is a laidback rolling treat and a sure play for many! Just one more reason why this limited, vinyl-only release is definitely one not to miss. Release date – 22nd July 2013 – On Limited clear 12″ Vinyl. City Ghost for me 🙂 Breezing! Support from Detroit!!! Lovely deepness – Very nice release. Enjoying the moodyness of the tracks. Lush. Support. Great Deep House tunes, and darwin’s theory is a perfect slo mo music for warmup sets. Nice EP all around !Support. Nice & Cool! “City Ghost” = Dopeness! Cool release .. probably Darwin’s Theory for me! X-Press 2 support at club and radio show. DJ MA1 (Rinse FM) (Presenter): Touché has a nice old skool feel. Another nice & super House Release. All tracks are top for me & my Shows. Will play & FULL SUPPORT !!! Great EP, Touche for me… support, Thanks for the Music! 4 tracks of lovely deepness here. All 4 tracks are excellent. Will support. Really into Darwin’s Theory and City Ghost. X-Press 2 support at club and radio show. A nice vibe throughout, Breezing my immediate fave. Support. Cool vibes, loving 3 of em, so will pick up the wax. Touche and Breezing are very very very good. The type of style I Love. Lovely Ep 🙂 Classy delivery of a great selection of jazzy House. My favourite is probably “Touche” but they are all quality. Support from Lo Shea! Some deep, bumping house goodness here that certainly gets the seal of approval. Breezing & Touche are the standouts for me and both will get much support. Pretty much everything I love about house in this release. Forthcoming feature on IA. Great one! Love Breezing and Darwin’s Theory! Feeling city ghost, but all really good and playable, will test em all at some point thanks! Ibiza Sonica (The Fix) (Presenter): Nice EP! Propaganda (Brussels FM 98.8) (Presenter):Cool, deep. love it. I like ”Darwin’s Theory”, so niceee! Feeling the slower trax a lot. Full support!